Talk about best of both worlds. 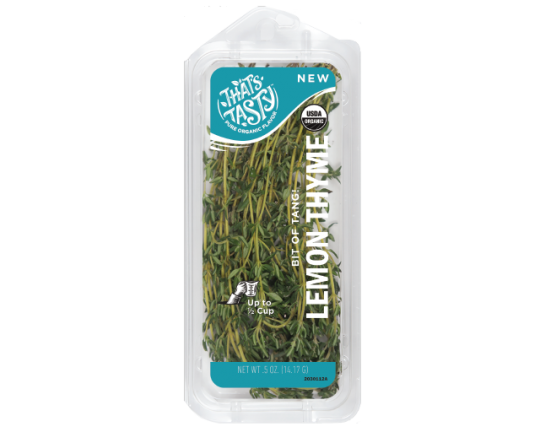 Lemon thyme delivers a soft herbal thyme flavor, along with a subtle essence of lemon. It’s a little bit sweet and a little bit sour. It pairs well in everything from salads and vegetable dishes, to meat, and fish. With its astringent, lemony flavor —you won’t be disappointed! The dainty flavor is best used fresh or in the very last moment before serving to make sure it doesn’t lose anything during the cooking process. Sold at the peak of freshness. Our Lemon Thyme is grown and sold to be used right away for the best flavor. Triple the amount you would use for dry herbs and add just before serving. Lemon Thyme is happiest inside its package, hanging out in your refrigerator drawer. Lemon Thyme is best used fresh! Make an infused olive oil. First strip off the leaves of the lemon thyme stems. Place the lemon thyme leaves in a sterilized mason jar and top with a quality olive oil. Cover the herb by at least 1-2″ of oil. Place oil in sun and let infuse for 4-6 weeks. It’s great if you can shake the herbs in oil daily during this time. Then strain the herbs and place in a clean sterilized jar for use in salad dressing, in a marinade, dipping oil … the possibilities are endless! Tip: Brush this on grilled shrimp for out-of-this-world fresh flavor! Make an infused vinegar. Directions are the same as making oil above, but replace the oil with a premium vinegar. (A nice white wine vinegar is great!) Great for making salad dressings and marinades or make it as a gift!